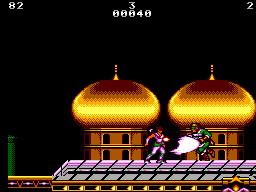 You play as strider the youngest yet most able strider chosen by his elders to stop the grand master Meio from taking over the world. 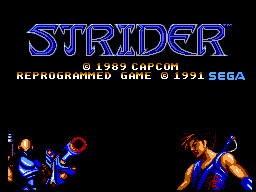 I first played Strider on the Megadrive in around 1992 and loved it and still rate it as one of the best of it's kind as an all action platformer,so I thought i'd give the Master System version a go. When I first played the game I thought it was very basic compared to the 16-bit version,roughly the same game only much worse gameplay at times it can be very unresponsive and frustrating.I feel that this game shouldn't have been released at all,you can't cram a brilliant 16-bit game on to an 8-bit console,maybe the Master System was best off sticking to Disney's and other cutesy platformers. The character sprites aren't too bad however the background most of the time is just plain black, just 'nothingness'. The music isn't up too much and I'm sure it's the same tune on every level. The sound effects are very weak also just to match the BGM. This is the biggest letdown to the game,the controls are extremely unresponsive and I do mean extreme. Possibly the most unresponsive controls I've ever come across in any game,just try the first level boss,you can press jump 10 times and he still doesn't jump. 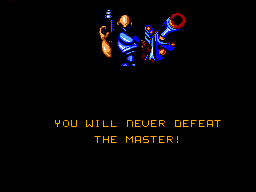 Personally I played it quite a bit until I managed to complete it. However I wouldn't recommend anyone else trying this,you may end up bald or grey.How or why I went back to this game after even 5 minutes of play is beyond me,maybe I need to see a shrink. This game is horribly frustrating it can be really difficult at times.It also boasts major slowdown and very,very,very unresponsive controls mixed with below average sound and graphics guarantee you will only tolerate this game for 5 minutes before throwing it at the wall.